Mr. Sadjadpour - why don't you do chemotherapy on yourself? In the many years since my father went ill and I've commuted between Kerman and California, I have seen not only the toll of cancer and alzheimers on my father, but also the toll of repression and sanctions on my homeland. Ten years ago, my father's neighbors spoke of the time of the Shah as an era of freedom and prosperity. Today, the same neighbors reminisce about the freedom and wealth they enjoyed under Khatami. Seldom have I seen a country lose its future, and the youth lose their hope, as fast as in Iran. I blame everyone. I blame the regime for its repression, corruption, incompetence and foreign adventurism. I blame the reformists who like true, useless intellectuals were debating theories of democratization while the Sepah and Khamenei stole their power under their noses. I blame the United States for making everything worse by waging economic warfare against the Iranian middle class and the poor through sanctions, and for bringing out the worst of the regime by threatening war. But perhaps most of all, I blame the Iranians outside Iran who have been cheerleaders of the sanctions campaign that has hurt the people so enormously. Because they deliberately made us in Iran guineapigs in their selfish experiments. In the struggle between the mullahs and their opponents, both the regime and the exiled "analysts" have used the people as cannon fodder. One such person is Karim Sadjadpour at Carnegie Endowment. Even though he is just a junior analyst, his steadfast advocacy for sanctions has enraged me precisely because he is so crude about using the Iranian people as cannon fodder. Today, as even the western media reports that simple medicine cannot be found at Iran's hospitals and young children are dying as a result, I would like to ask Sadjadpour and all the Iranian sanctions advocates in Washington: How's this working for you? Are you happy with the results? Will you, like Madeleine Albright did in Iraq, say that even the death of 500,000 Iranian children is worth the price? Let me tell you how this is working for me and my family. First, the thugs that stole our country in 1979, also stole my family's company and factories, our home as well as most of our savings. Then they stole our votes in 2009. In between, they beat us up on numerous occasions and made thousands of dollars off of the bribes we were forced to pay them to regain our limited freedom. 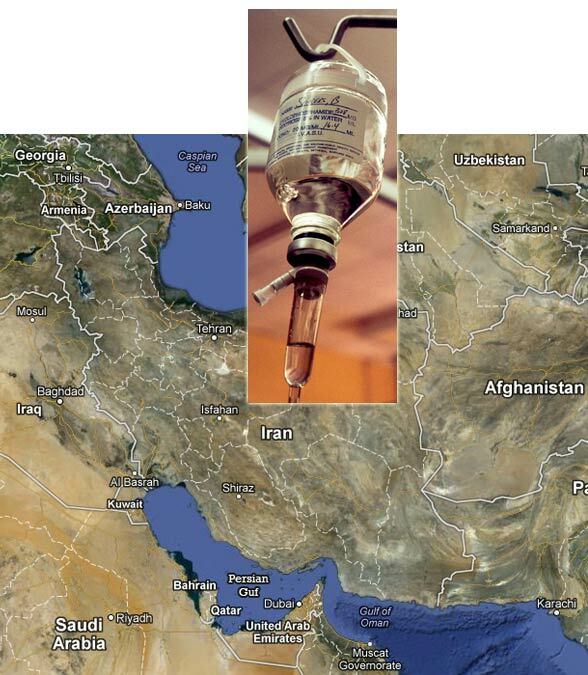 Having survived all of that, now we have to cope with Sadjadpour's selfproscribed chemotherapy. Through these sanctions, we lost another half of our savings as the rial plummeted. But much worse, the chemotherapy my father needed first became too expensive and then simply unavailable as a result of the sanctions. Instead of some sort of a cure against the cancer of the regime, Sadjadpour's sanctions chemotherapy actually deprived my father of the real chemotherapy he needed and sentenced him to a certain death. My father doesnt know this though, because we can't buy him the medicine he needs for his alzheimers. The rest of us suffer as my father blissfully withers away. This one is due to Sadjadpour's chemotherapy, not the repression of the regime. I wonder if Sadjadpour and the other sanctions advocates suffer. I wonder if they are as enraged by our pain under sanctions as they are by our pain under the regime's batons. I really would like to know. Did they think we would rise up against the regime and literally become cannon fodder once sanctions had deprived us of both food and medicine? Well, so sorry to dissapoint you Mr. Sadjadpour. Not being able to eat chicken have not made me and my family revolutionaries. It's only made us weaker and more hungry. Not being able to provide my ailing father with medicine has not turned me to the streets throwing stones at the Basij. It has only made me depressed and caused me to create an alternative existance on Facebook. I'm so sorry Mr. Sadjadpour, I know that I'm not the type of cannon fodder you had hoped for. The ones that happily would take a bullet in their heads for you so that you and your family could book a first class ticket and visit Iran without having to put on a ro-sarie. I'm really sorry Mr. Sadjadpour, but it's just that between the hunger and the anger, I've realized that a true friend is not one that forces the weak and the repressed to fight for him, but one that uses his freedom and strength to fight for and protect the weak. I've chosen to stay here in Kerman, to be by the side of my father. To hold his hand in his last moments in life, even if he doesn't remember me as the sanctions kick in and the last doses of medicine kick out. I won't do to him what you and the regime have done to us, Mr. Sadjadpour. PAAIA Responds to Criticism of "Sanction Report"